Create with meaning. Create with passion. Create with purpose. What I’ve learnt from creative projects is, it’s just as much about the process as it is the final product. It’s the experience, the feeling you get. If this is done with meaning, passion and purpose, more often than not you get a great result. I love the buzz from collaborating with inspiring people. When sparks fly. When creative tensions arise. Special things can happen. Christmas was approaching. We wanted to capture our creative spirit and share it with our clients in a meaningful way. 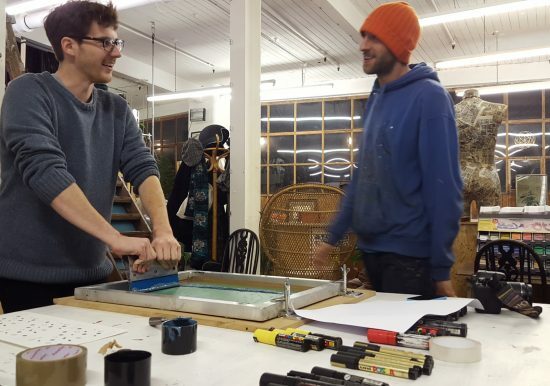 We came together in our friend Joe (no brand) screen print studio in Leeds. Our very own Joseph Parsons was designing on the train, as he made his way north. Using our brand concept of ‘we will guide you’ spelled out in Morse code, Joseph created three design options. 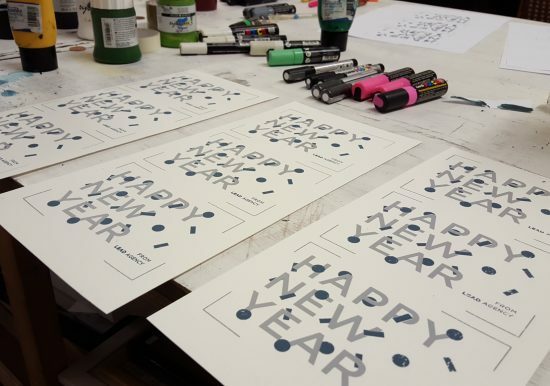 We went with the fun Morse code confetti with a bold, bespoke typeface saying ‘Happy New Year’. We chose a high value off white paper stock and teal and silver inks. Matching our brand colour palette and introducing a dash of festivity. Joseph measured and marked out the card size and hand pulled screen printed the first layer. After waiting for the ink to dry, the second screen layer was printed. Jago – the new brand.